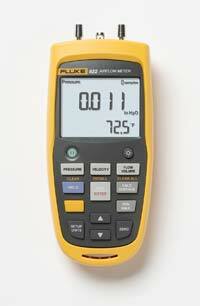 The Fluke 922 combines differential pressure and air velocity and flow measurements in one meter. It enables technicians to monitor air pressure across HVAC components and check for optimum airflow balance. It features colored hoses designed to help users interpret pressure readings; minimum, maximum, average, and hold functions; a backlit display to view data in dimly-lit environments; and an automatic power-off function to conserve battery life. It comes with two rubber hoses, a wrist strap, four AA batteries, a users’ manual and soft carrying case.